You need time for this recipe! You also need a bit of patience but the rewards are there at the end of the journey and the more often you do it the easier it gets! It's a great dish to make for a dinner party if you want to impress your friends! You can also do a fair bit in advance allowing you to spend more time with your guests and less time in the kitchen. There are three elements to this recipe: the pasta, the filling and the sauce and in total to make it from scratch I would set aside a couple of hours - especially if this is your first time making fresh pasta! You can make any type of filling you like. It doesn't have to be vegetarian either! Some possibilities include, mushroom, pumpkin, spinach and ricotta and even bolognese. It can be a good way to use up leftovers by mixing a vegetable or a minced meat with a cheese (most usually ricotta). You can make the fresh pasta in advance. Some people like to make a lot of fresh pasta when they make it (as it does take time and can be messy!). If you do this, you can freeze it either at the dough stage in small batches and take it out, defrost and use it as you need it. You could also freeze the ravioli once you've make them. The filling too can be made separately and in advance. As the flour and egg mixture comes together, begin to nead. If it is too wet it may need more flour and if it is too dry it may need more egg. Roll the dough out into 2 thin and flat sheets either with a rolling pin or pasta rolling machine if you have one. You could mix the ingresients in the initial steps above in a food processor if you wish. Leave to cool slightly once removed from the oven and then remove the flesh, discarding skins and any remaining seeds. You could mix the ingredients in the final few steps above in a food processor. With each mound of filling start to push the second layer of pasta down in such a way as to remove the air from the pocket of filing. Once you do this with all 'filling pockets' you should then end up with a sheet of pasta from which you can cut out the individual ravioli. Cut out each ravioli one by one, dust it with flour and put it to one side. As the butter begins to melt add the ravioli and coat with the sauce. It is sometimes a good idea to reserve some of the water the pasta has been cooked in and add a spoonful or two to the ravioli and butter if it looks a little dry for your taste. 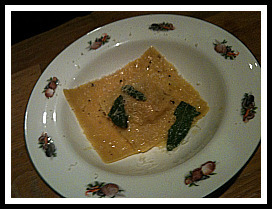 Ravioli are often served with butter and sage sauce and a sprinkle of fresh parmasan. They can also be served with a pesto sauce or even a simple tomato sauce. You can make ravioli of different shapes and sizes as well as any number of the different fillings mentioned above. The only restraint is your own imagination! It seems likely that ravioli originated in northern Italy but now is enjoyed with different fillings throughout the country.